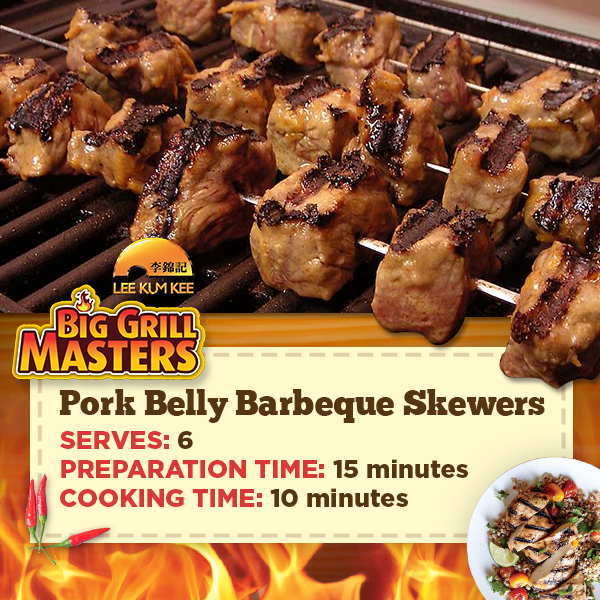 Give your favorite inihaw na liempo with an oriental twist when you try this easy yet delicious recipe by Lee Kum Kee! 1. Cut the pork into long thin slices, about 5 mm thick and 5 cm wide. 2. In a large bowl, combine the pork, soy sauce, garlic, onion, Calamansi juice, pepper, sugar, banana ketchup and the lemonade or beer (this tenderises and adds flavour to the pork). Cover and refrigerate for at least 30 minutes, turning occasionally. 3. Thread the pork strips onto the soaked bamboo skewers, reserving the marinade. 4. Cook the skewers over live charcoals, turning and basting with the reserved marinade every few minutes for about 10 minutes or until cooked through. You may glaze the top with Lee Kum Kee Char Siu Barbecue Sauce.